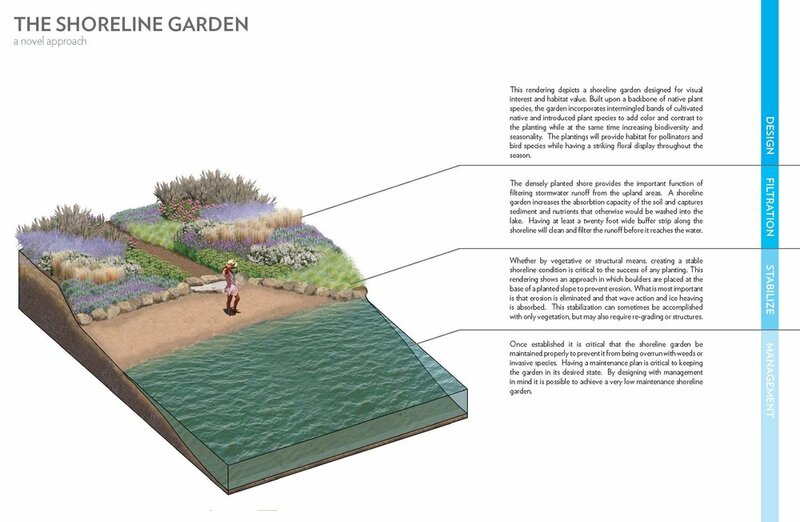 A shoreline garden is a sustainable planting at the water’s edge that stabilizes soil, filters runoff, provides habitat, and satisfies the aesthetic and maintenance preferences of its owner. So long as the shoreline garden follows the rules of thumb, the shoreline garden can be any style the property owner desires. It is important to remember that shorelines are more dynamic environments than traditional gardens. They must be able to withstand wave action, flooding, and other destructive forces. As a result, the selected plants must be adapted to tough conditions while also being attractive to humans. We literally wrote the book on this subject.